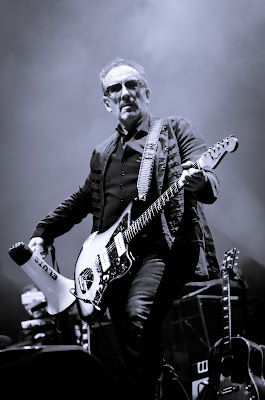 Anyone anywhere in the world who has seen Elvis Costello and The Imposters live can testify to their unmitigated swagger. Now, in their most intimate Chicago setting in nearly 20 years, they've been confirmed for one-night-only at The Vic Theatre in Chicago on November 14. Show time is 8:00pm and doors open at 7:00pm. General admission main floor tickets ($88.50) and reserved seat balcony tickets ($153.50 / $128.50 / $98.50) will be available Friday, September 21 at 10:00am via www.JamUSA.com There will be a strictly-enforced 2-ticket limit. All ticket orders are non-transferrable. Patrons must be 18 or over to attend. Elvis Costello and The Imposters – Steve Nieve (keyboards), Davey Faragher (bass), Pete Thomas (drums) – have made a sensational new album that ranks alongside the best work this singularly great artist has ever produced. Costello's suspicion that it was time to return to the studio was confirmed while on the 'Imperial Bedroom and Other Chambers' tour of the USA, last summer and he realized the power and sheer musicality of The Imposters had never really been fully captured on one record. “I knew if we could make an album with the scope of 'Imperial Bedroom' and some of the beauty and emotion of 'Painted From Memory,' we would really have something," said Costello. Fans can expect the band to play songs from the new album and from throughout their career.